30 days ago the plan was formed, albeit a drunken misinformed plan was cobbled together, but here we are 30 days later and said drunken plan is about to come to fruition. Tonight will be the first of, what I hope are many, Second Saturday Suit Up’s! The plan is basic, throw on your best suit, or any suit for that matter – for myself I am rocking the highschool graduation suit, my financial situation doesn’t allow for a new suit in the budget, even though as a 30 year old I seriously need a new one or two - and go out on the town, causing trouble and awesomeness wherever you go. Will tonight be legendary? Will debauchery ensue? We can only hope. 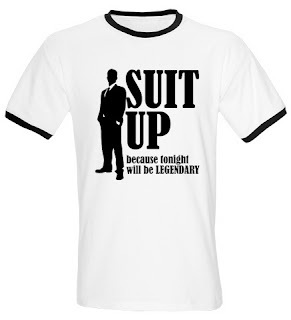 Until then, Suit Up!